Yours, and theirs. Let’s face it, catching fish isn’t easy. Those families that buy rods and tackle boxes from the department stores are only in it for cheap thrills, not the excitement of maybe catching the big one every time you throw your line in. But kids don’t know about that excitement yet, so you’ll need bucket loads of patience every time you head out to the water. Don’t expect to get your line wet while you’re fishing with kids, all your time will be spent casting and re-baiting hooks and untangling lines. And after a short period of time (depending on age), they’ll lose interest, so always try to find a fishing spot that has other things for them to do, maybe a playground, or bring a ball. Having everything you need to hand is important. Reels that don’t tangle every time you use them will ensure the kids stay attentive while you’re showing them, and not drift off to something else while you untangle another snagged mess. Rods that bend and flex as fish bite so kids can feel that they’ve hooked something make the catching bit just as exciting as the casting bit. Sharp hooks that stay in the fish’s mouth so the fish actually reaches the surface for that glorious “I caught a fish” photo that mum is going to share on Facebook are much better than mass-produced department store gear. Spend a bit of time in the store, asking for information from staff, asking the kids what they want (colour is especially important), and choose gear that they can grow into in a short period of time. It’s easy to fall into the trap of doing it all, but fishing with kids is about them learning the skills themselves (under supervision.) Teach them well, and they’ll love it forever. Replacing the line – replace the line on reels yearly, and always match the rotation of the new spool to the bale, to avoid twists. Baiting a hook – worms are the best bait for beginners. Show your kids that the worm should cover the hook to hide it from the fish, and always hold the worm on the sides, not the end, to avoid the piercing tip of the hook. Clean your rod – just like cleaning your dinghy after a trip, it’s important to clean your rod, too. Start by sanding any nicks in the guide rings so your line doesn’t catch, and check for rust spots and sand them away, too. Clean the whole rod with warm water, and ensure its stored either horizontally or vertically in an open space to avoid trapping moisture. Start the boat – now it goes without saying that your kids wear a life jacket every time they get in your boat, if fishing from a boat is your thing, but do they know how to start the boat or call for help if something goes wrong with you? Knowing how to set off a flare, or start the EPIRB can make all the difference if, heaven forbid, you take ill while out on the water, and knowing how to start the boat may save your life one day. Throwing the rods in the car then bundling the kids in is ok for a random afternoon fishing trip, but if you really want to build their excitement and anticipation, get them to help you plan the next trip. Depending on age, they can easily use great local spots that have plenty of fish, or help mum pack a picnic lunch that everyone will enjoy. Show them how to safely load rods into the car so no one gets poked in the eye, and they can even help navigate the route. And sometimes anticipation of the journey is as much fun as throwing the line in. Taking photos isn’t everyone’s cup of tea, but when you’re a kid, it’s important to be able to brag to your friends about the awesome fish you caught on the weekend. Photos are the best way to do that, whether you snap a quick shot with your phone, or pull out the DSLR. And remember to print the photos, it’s easier to take a photo to school than a camera. 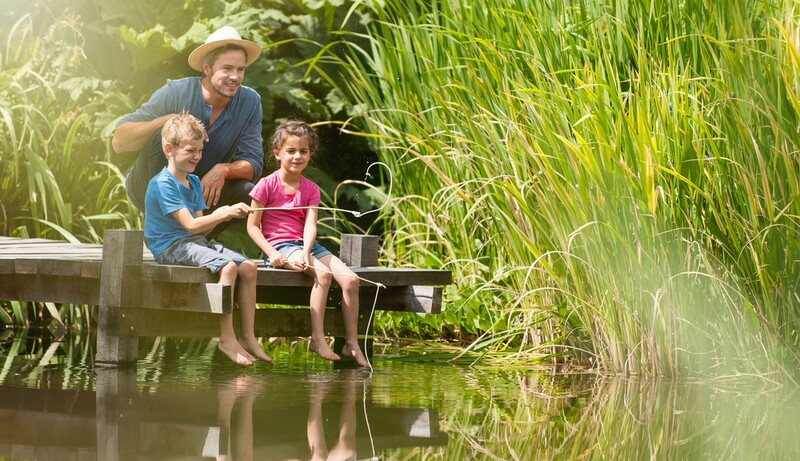 If you follow these five tips, and remember that kids just want to have fun, then fishing with kids will become a family adventure, and you’ll never have a moment’s peace again. Contact Almac Trailers today on (07) 4152 3737 for all your boating needs.